The Pretenders were on stage from 8:05 to 9:00 p.m. They delivered a strong set and the crowd did enjoy their show. Chrissie Hynde mentioned the two members of the Pretenders who had passed away and stated how they would have loved to have been there to open for the Stones, she said, "Maybe too much." Comiskey Park was filled and ready to rock. The show started very strong, but the first real thrill was hearing Undercover. The thrill continued on with Angie. Both songs sounded excellent. The audience sang along with You Can't Always Get What You Want. The Chicago crowd was very vocal. Monkey Man was a great follow-up here, although Lisa was not involved in the song as done previously. Mick sported the white hat and coat as the band played a great version of Love Train. That was a great song choice, especially at this time in history. Keith did a great job with Slipping Away and Before They Make Me Run. Then into Sympathy for the Devil. The atmosphere with the smoke rising from the stage, the crowd participation, the music, it all kept drawing people in more and more, almost like being in a bar rather than among 40,000 people at a ball park. Mick came out in a black hooded jacket for Midnight Rambler which added to the atmosphere of the song. It's great to see different setlists for each show on this tour. The quality of the performance has not suffered. If anything, it has added a certain spontaneity that may have been lacking in some of the recent tours. We're looking forward to the next show. Hi folks. Here's some of my impressions of the show last night. Well, let me start by saying the STONES sure "Rip[ped] This Joint," at COMISKEY PARK, (even tho they didn't play this song selection). The Boys were strong, let me tell ya. The audience was really good too, ready to rock, I mean they absolutely roared all night long! BROWN SUGAR started us off and then START ME UP, (I love that song), really gets ya going. UNDERCOVER was played earlier in the set this time. Then ANGIE was played, (I had been hoping for this one again soon) it's such a lovely song, sad as it may be, but really a jewel and it should be done more. MONKEY MAN, I really enjoy this tune, fun to watch Mick act this one out. LOVE TRAIN is growing on me. Keefs two songs were the same ones he did at the ORPHEUM and The GILLETTE, so I wonder if those are two that he'll do a lot together? I hope he pulls out some others on the tour. (We got BTMMR a lot on the NO SECURITY Tour). SLIPPING AWAY was awesome, Keith sure knows how to capture a mood. LITTLE RED ROOSTER was a pleasant surprise on the B stage, so was LIKE A ROLLING STONE. I guess TUMBLIN' DICE is a permanent fix, for the Arena and Stadium shows, so far anyway. The night ended way too soon, with MIDNIGHT RAMBLER and (I Can't Get No) SATISFACTION for encores. Now, if only they'd add LOVE IS STRONG to the set. Mmmmmmmmmmmm? 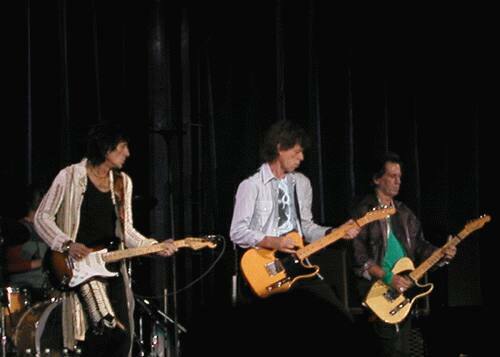 I hope the STONES do RUBY TUESDAY and MEMORY MOTEL too on tour! Way to go, hats off to all the band and crew! Great job! Note: The Pretenders are a really good band to open with, good choice. This was my eleventh Rolling Stones show since 1978, the first one of the Licks tour. I was to the left of the stage in the upper concourse. The view was good, and I was closer to the stage than a lot of the other seats on the decks. And it's Friday the thirteenth. The sound was the worst I've ever heard. The Pretenders sounded like a lot of thuds with an echo. Too bad, I'd have liked to have heard them, I'm sure they were very good down there. I figured the Stones would have a better sound. And they did. Slightly. Maybe I'm asking for too much, or maybe it's just I've seen the Stone's too many times, but for a $90 plus ticket, to see the "Greatest Rock n Roll Band in the World", I'd have thought they'd have obtained the best sound system in the world. The set list was not what I was wishing for either. Except for "Don't Stop" and "Love Train", I'd heard them do all the other songs before, and most of them way too often. By the way, I always hated "Love Train" and couldn't picture them doing it and had hoped that they'd have worked some magic with it. Nope. I found myself beginning to wonder what they rehearsed for since after 40 years they should have know these songs inside out. Yes, my favorite band has let me down by doing a show containing mostly hit singles. Sorry, but I thought their warhorse songs were done no differently live this time than in all the previous tours from 1978 onward. The only difference being the back up band supporting the "Mick and Keith Revue". It appeared to me that Keith is more interested in striking a pose than playing his guitar as they once again mangled so many of their hits. Mick should have spent the last two years working with the Stone's instead of his solo projects. Maybe then they'd have had an album with something new and different for me to listen to and Mick could have sold some records. The stage was pretty plain and no frills. They should chuck that big stage and do the whole show on the little stage in the middle. Perhaps if they put the speakers there above them facing in all directions the sound would improve, too? No change this tour with the supporting musicians they have been using in every tour since Voodoo Lounge. The whole show just looked and sounded like more of the same, but somehow less. It used to be there was some new material in a show. A couple cover tunes as well. Let's not forget the "Greatest Rock n Roll Band in the World", started it's career as being the "Greatest Cover Band.....". (Hum, I've all ready forgotten about "Love Train", doh!) A couple unused songs and then the classic 15 numbers that "Must be done to satisfy the fans". I suppose they're doing it right, they do make a lot of money at it. I can't always get what I want. I can't get no satisfaction from this show, and I tried. It is only rock n roll, but I like it, and I wanted something different. However, they rocked the entire stadium (to a point). As I looked about, everyone, all the way to the top, was standing and into it. Perhaps they'd never heard those songs done live before? Well, come on folks, they have an enormous wealth of songs in their catalog but it seems they'd prefer to stick to the same old tunes for the stadiums. I suppose if it's working for everyone else but me, why not? What do I know? I'm just a fan that supports the band by buying albums and tickets. Or perhaps not buying them? Angie was very well done, as was Monkey Man. There was far too much rumble in the sound for me to comment on all the other tunes. I was heading for the door during the thrashing of Jumping Jack Flash sampling the sound from different points in the stadium. The flood of people coming from the stadium convinced me that the show must surely be over. Thousands were pouring out the doors like the place was on fire. Now I'm wondering just what kind of fans bought tickets? Or maybe they didn't like the sound and or performance either? To sum up, if I had known the set list and sound quality prior, I'd have given away my ticket and spared myself the 500 mile drive. This is very depressing for me to say. I'm a long time fan with their entire catalog of music, video, and even stuff I'm not supposed to have. But that show was poor. I will never go to another Stone's stadium show ever again. Hey Mick, Keith, Charlie, Ron, you can make it up to me by refunding my money or sending me tickets to one of your smaller venue shows!!! Do some different songs and I'll write you a good review!!! Hell, do the same songs, perhaps try working on doing them differently, (hint, try doing IORR or JJF like the original album versions, that would be a first, sounds like your sick of them too and that's why they're so rushed) and I'd be satisfied. Keith, didn't you say something about putting some more ammo in your belt for this tour.....? "You Got the Silver", use it. Send your sound man up to the top of the stadium during the show and maybe he can figure something out? And if your reading this, I'd have taken my wife and kids ages 5, 9, and 11 to the show if it didn't cost so much. I took my son and daughter, then aged 6 and 4 to a Bridges of Babylon show. They're big fans, too. A $500 minimum for a night out with the kids is too rich for us. Sorry if you think I've been to hard on you but I know you can do better. I have to substantiate the comments made above by Mr. Hogan and add a few thoughts of my own. I was at the United Center on Tuesday and thought the show was great. The band played well and choose well. Their "Greatest Hits" have degenerated into a boring, repetitious formula and this is why the Comiskey show was so disappointing. This shortcoming could be easily avoided if the guitar players would focus on their playing rather than their posturing AND if we could hear the lead guitar from time to time, rather than a chord sequence repeated ad nauseam. The best songs at the United Center were the ones that are rarely, if ever played. The reasons? There are two. First, it's just plain refreshing to hear these gems. Second, since the band is not used to playing them, they actually concentrate on what they are doing. Stray Cat Blues and Can't You Hear Me Knocking were wonderful because the band was actually paying attention to what they were doing. It was very obvious by the expressions on their faces. What made the Comiskey show so terrible is that the band was going though the motions and trying to look cool for the big screens. I cannot forgive Keith Richards for absolutely destroying Gimme Shelter on this night. No one who was there can argue that this was even played adequately. On the other hand, Slipping Away nearly made me cry. Yes. This show did have some high points: Undercover, Angie, Slipping Away, and Before They Make Me Run. Please notice that these songs are mostly outside the standard repertoire. I agree wholeheartedly with Mr. Hogan. After 28 shows, I cannot bring myself to another stadium show. This band needs to remember that they are musicians first and performers second. And this leads to me to my last rant. The problem that I see is that these are no longer concerts, but events: the fireworks, the confetti, the videos. Each tour seems to have less and less to do with the music and more with spectacle. I find this a real tragedy, since I know this band can still play like no other and has a catalogue like no other. There are those handful of songs at each show that are truly unequaled. I know you guys have to do some of these songs to keep everyone happy, but please don't end with 2 to 3 minutes of a three-chord progression played over and over and over, with a horn section doing the same. I'd like to hear some guitar playing. The Stones need a lead guitar, either turn up the volume on Ron Wood (and give him a chance) or get a new lead guitarist and make Keith stick to rhythm (which he does better than anyone). I have to say the day went pretty well to start. A very dear friend of mine and his wife and my girlfriend went to go see the Stones. Krok, my buddy and I set a goal to see the Stones on the "next tour" because at the time the weren't touring. Last night was the night! For me it was really going to be a great night the Stones and my friends and the best part Stacy my girlfriend had never seen them! We got to Comiskey about 7:20 and we were not sure of our seats (I bought them from the IORR message board) we hit the parking lot to buy our shirts and then into the show. We bought our shirts and then went back to the car locked them in and on to the show. Our seats were in 329 and we were ready to go! Walking around the stadium we saw a Chicago event shirt not sold outside! Go figure!! The seats were great and we grabbed a couple of beers and off to the seats! I do have to say I was so lucky to get our seats at face! God I tried for weeks to get the best I could and we hit the Jack Pot! The Pretenders were good I bet if you were a fan, but I am not so on to the Stones!! This was the 5th time I have seen the stones so I wanted some of the rare songs and I guess in away the did deliver. If you look over the set list you will notice songs not played on the last tour and so on. Sure I could say I would rather of seen this instead of that and so on, but it was a great show. The only problem was the sound was shot on the small stage for neighbors and that was a shame, it did get better for little red rooster, and fixed by the last song. All in all a great concert and for Stacy she was so happy when they played her favorite, Gimme Shelter! Thanks to Jim Pietryga for the great photos on this page! Thanks to Arno Kl�nter for news links. 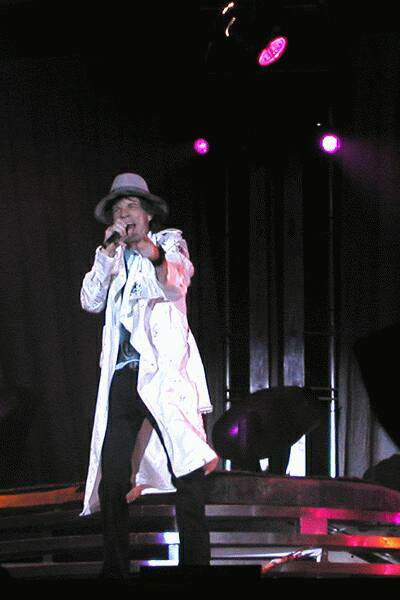 For details and great photos from the Rolling Stones and their World Tour get IORR 45 due out by mid September 2002.